Obviously, after just giving birth a whole 14 months ago, I struggle with my weight. Although I’m not pregnant anymore, the appetite didn’t go away. I thought – “Perhaps I need an extra boost”. I thought about going to the gym, but I don’t have the funds for that. I thought about getting a liposuction-type shot, but I don’t want any pain either. Then, I found Green Tea Plus. It is a herbal metabolite and appetite suppressant. What I really like about this is the fact that is is gluten-free. I try to be as health-conscious as possible, and with pills…it’s quite hard to do so. Not with Green Tea Plus. I reviewed this for about a month, and I can already tell the difference. I’m chowing down a little less, which has made the numbers on my bathroom scale decrease, as well. Green Tea Plus is the only complete, natural weight loss formula clinically proven to boost your metabolism without artificial stimulants. Green Tea Plus capsules are made with a 100% herbal formula, and can help with your natural weight loss, exercise and diet program. Their herbal weight loss formula contains NO unsafe chemical compounds – just natural herbs that have been used for centuries to boost metabolism and burn off stored body fat. I’ve never tried green tea, let alone green tea supplements. The capsule went down easily, with no difficulty. I have a hard time with pills, and I had no problems with it. This natural weight loss supplement DOES work after time…like with all weight loss supplements. The only difference is…THIS works. 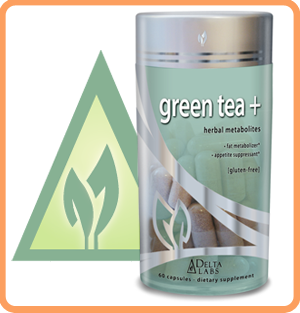 It is a natural weight loss and metabolism boosting supplement by Delta Labs, which can trim your waistline with a unique blend of fat-burning ingredients. They have combined the proven potency of seven natural weight loss aids, including two of the best energy catalysts ever – acai berry and green tea – into a unique formulation that can support your weight loss goals safely, swiftly, and for sure! They are so confident that you’ll love their Green Tea supplement, that they offer a 30 Day, Money Back guarantee. If you don’t find that their Green Tea has helped to boost your metabolism, curb your appetite and help you lose weight, simply send them back the bottle for a full refund. One lucky winner is going to receive a 60 count bottle of Green Tea Plus to try our for themselves!! “Like” Naturally Fit on Facebook. GIVEAWAY ENDS JULY 5TH AT 11:59PM (CENTRAL TIME). The winner will be chosen at random.org. I will e-mail the winner, and they will have 48 hours to claim their prize. Disclaimer: I received one or more of the products mentioned above for free using Tomoson.com created by WebBizIdeas.com. Regardless, I only recommend products or services I use personally and believe will be good for my readers. I am disclosing this in accordance with the Federal Trade Commissions 16 CFR, Part 255 Guides Concerning the Use of Endorsements and Testimonials in Advertising. Tomoson Product review & giveaway Disclosure. I “Like” Naturally Fit on Facebook. I “Like” Naturally Fit on Facebook (FB name: Maddie Brubaker). I “Like” Beautifully BellaFaith on Facebook (FB name: Maddie Brubaker). I entered the Scott's Liquid Gold giveaway. I entered the Dragonfly soaps giveaway. I found this giveaway from your email. I like naturally fit on facebook! I like Naturally Fit on facebook. I found this Giveaway via Just Contest Stuff blog. I am a facebook fan of Naturally Fit (Marysa N). I found your blog on Tight Wad in Utah (blog). Entered your Spoonful of Comfort giveaway. Entered your Power Capes giveaway. Entered your My True Nature giveaway. Entered your Get Ripped giveaway. I am a fan of Naturally Fit via Facebook as Jill Myrick. Tightwad in utah is where I found out about your blog. I voted for your blog via Picket Fence Blogs! I entered your Save the Ta-Tas Giveaway! I entered your Shapelets Giveaway! I found this giveaway on your blog! I found this giveaway by googling Delta Labs. I just voted for your blog.